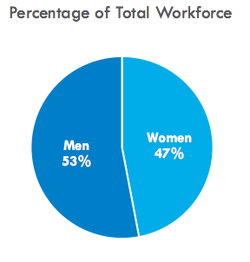 According to a census conducted by the United States Department of Labor, in 2010, women made up 47% of of the work force, with 40.6% of those women working in "management, professional, and related occupations". A recent study by the Center for America Progress puts that number at 52% as of 2014. In 2010 alone, there were 72 million women in the labor force, either working or actively looking for work in the United States. Women earn approximately 60% of all undergrad degrees, and 60% of all graduate degrees. They are working in highly skilled, high paying jobs and generally have a lower unemployment rate than men. But there's a problem. A big one. As you can see from the graph above, women with higher levels of education have a higher percentage of participation in the workforce. Numerous studies, including the 2010 census, have made a clear connection between the level of education and a person's ability to contribute to the labor force. 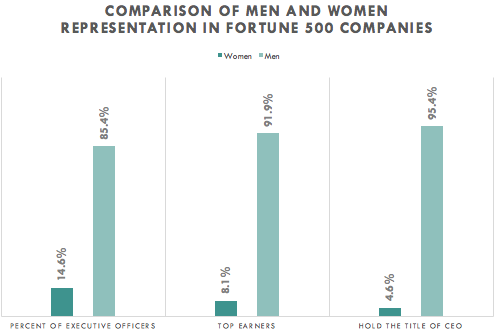 Given that 72.4% of women with a Bachelor's degree or higher are active in the workforce, the number of women in leadership positions is shockingly low. Fortune 500 companies are a sort of a pulse point in America; they're seen as industry leaders. Often times, these companies are setting precedents - they're the proverbial guinea pigs that smaller companies watch, waiting to see if their experiments work. The fact that these front-runners have not deviated much from their leadership model, as evident by the chart above, means that other companies may hesitate to do so as well. WIOA helps job seekers acquire industry-recognized credentials for in-demand jobs. Training that leads to industry recognized post-secondary credentials is emphasized. States and local areas will use career pathways to provide education and employment and training assistance to accelerate job seekers' educational and career advancement. One has to question the measures of success for workforce education programs. Is it based on placement rate? Gainful employment? How about employee satisfaction and retention? And what about equal job placements for both men and women? Although there are provisions for giving priority to under-served and under-represented groups, WIOA does not make concessions for the societal and cultural considerations that make success in the workplace challenging to women and minorities alike.